Thank you for your interest in becoming a distributor for Phone Lasso, LLC. Phone Lasso® is a safe and convenient method of keeping your phone within arm’s reach. Thousands of people, young and old alike are enjoying their Phone Lasso while at home, at work, and at play. They are talking, keeping in touch, calling for help when needed, listening to music and for all sorts of other purposes – the possibilities are endless. Imagine your phone being within reach without dropping or breaking it and without having to dig through a purse or pockets and without misplacing it. Nearly everyone nowadays has a phone or other necessary personal device to keep at his or her immediate reach. These can be an unlimited number of high-traffic locations doing business with the public. For example, cell phone accessory stores, postal supply stores, convenience stores, camera shops, beauty shops, tanning salons, barber shops, dry cleaners, truck stops, variety stores, shipping and packing stores, vet offices, gyms, senior care facilities, kiosks in malls, fund raising organizations and thousands of other places. Many people have already found success marketing Phone Lasso to people around them. In fact, one representative recently had over 500 sales in a single day at a resort area. Others have seen results through simple word-of-mouth advertising to friends at parties and bars, co-workers in the office, and wherever else they meet people. Individual Distributors like having “their own business” to work any time they wish to make extra money, whether it be full- or part-time. Phone Lasso, LLC has chosen this people-to-people method to market its products because the simplicity keeps distribution costs low and potential profits high for Dealers and Distributors. There are millions of hand-held phones used every day and they all need a Phone Lasso. All products are made in the USA of the best available materials. A company logo or slogan can be printed on the patch for a small additional fee. All components are patented in the United States. Authorized dealers buy and reorder directly from the company. Distributors buy and reorder directly from the Dealer. See the sample data below for prices and profit margins. Sample information generated from actual sales data. Last updated: 02/2017. If you are ready to make a low-cost investment for yourself, download and fill out the Authorized Dealer Request Form below. 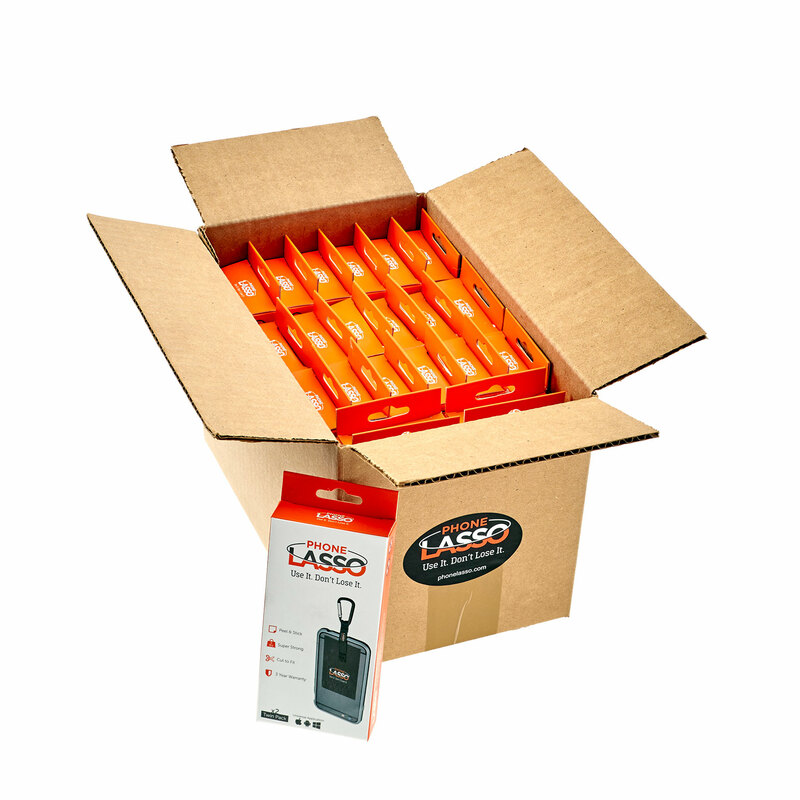 Once approved, you will be able to purchase Phone Lasso Kits in either Standard Cases or Master Cases. One Standard Case contains enough product to fully stock a display stand and one Master Case contains six Standard Cases. There is a minimum order quantity of one Standard Case per order. If you purchase a Master Case, your order will include, at no additional cost to you, an aluminum display stand with an LED video screen. You will also receive information for getting off to a fast start with sales in your area. Successful methods and techniques will be shared among dealers to strengthen the brand. Please feel free to contact us with any questions you might have by using the form below. Thank you again for choosing Phone Lasso, LLC. We look forward to hearing from you. If you are interested in becoming a Phone Lasso Authorized Dealer, please fill out the form below. A representative will review your request and contact you within two business days. 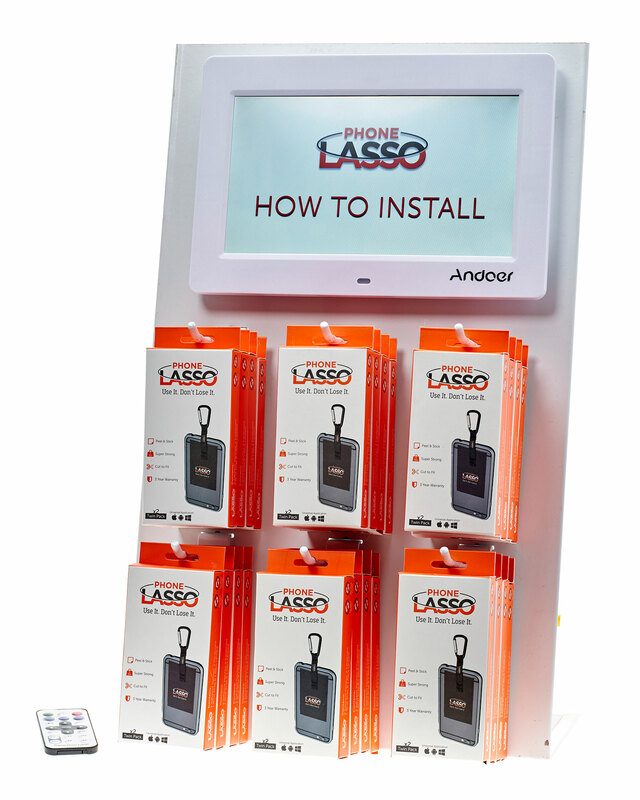 The Phone Lasso Authorized Dealer Program and all Phone Lasso distribution programs are not franchise offerings. Phone Lasso dealers and distributors are independent owners operating their own locations. Results may vary. All applicants are subject to review and approval by Phone Lasso, LLC in its sole discretion.